Ever since Cars Land opened at Disney California Adventure park in 2012, it has been a huge success. This new land immerses guests in the world of “Cars” and makes them feel like they are standing in the town of Radiator Springs. 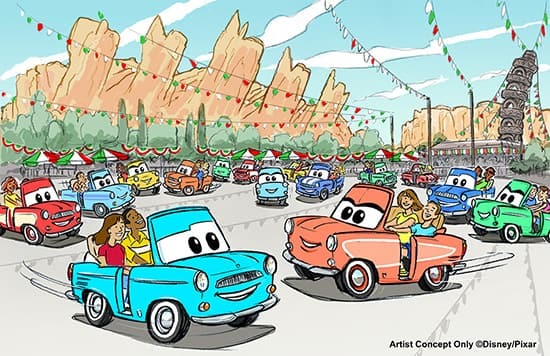 We’ve heard from our guests that the cars themselves are one of the things they really love about Cars Land – and today I’m excited to tell you about a project that will bring even more four-wheeled fun. At the end of the operating day on February 16, 2015, Luigi’s Flying Tires will close as our favorite Fiat departs for a vacation to his home country of Italy to visit with family. When he returns, his Casa della Tires will reopen as a completely new attraction in early 2016. The attraction will feature a new ride system and ride vehicles. We are excited to tell you more about this ride technology, so stay tuned to the Disney Parks Blog for updates as work progresses. The image looks really cool. It looks like bumper cars. Will this new attraction include Disney’s Fastpass. The line for Luigi’s Flying Tires was usually long. Adding the Fastpass would make the line much more short. The image looks very colorful but the old ride was more Italian. Luigi in the movie Cars and Cars 2 was from Italy and his tire store was very Italian. The colors of the cars are very vivid but aren’t Italian colors. I think that the cars should be green, red, and white. The new colors deprive from the Italian like feel. The renovation doesn’t look like a lot of work and it certainly doesn’t look like it will take an entire year. The new ride looks like bumper cars, yak!!! It’s going to be like any ordinary boring bumper car rides!!! I have been riding this ride since it open. I have been an Annual Passholder for so long. I really enjoyed this ride and had a great ride. It’s sad to hear it closed. 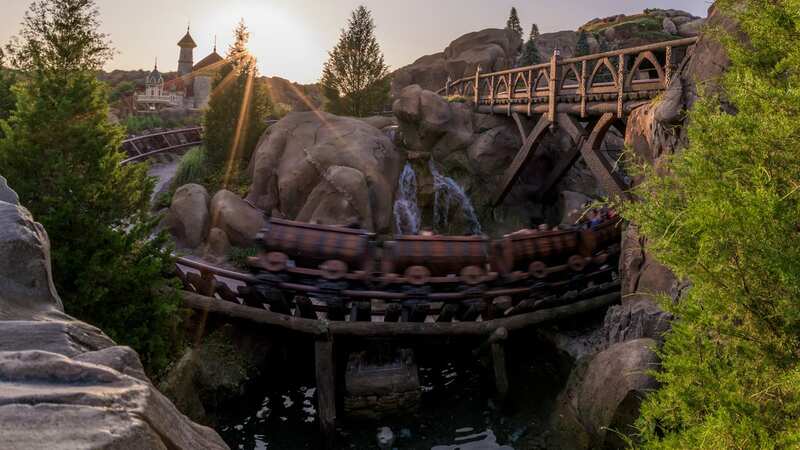 This ride is one of the fun rides in CA Adventure. I like this ride. It’s fun and challenging. Why closed it? It’s Disneyland’s 60th Anniversary. of old. I even have a photo hanging in my house of myself and my brother riding them. Those were the good ol days! Excited to see what you have in store for us next year. Perhaps the new ride will be trackless, like the Pooh honeypot ride in Tokyo Disneyland. Scott–From what I understand, this flying tires replacement will not be a spinner like the Race Rally attraction in Paris. The new Luigi ride is rumored to use a trackless ride system. Wow great but this looks allot like the ride in Paris. I hope that the queue will be kept the same. I also hope that the ride will still have the same music. Will they be keeping the queue area open through the refurb? Inside Luigi’s is one of our favourite Cars Land Photo Ops. I love this ride ~ sad to hear it’s going away. Both of my children, ages 9 and 6, were so disappointed to hear about this. I wish there would have been more warning so we could plan one last visit for the flying tires. I do so hope you keep the Guido photo bomb room for the queue of the new attraction. NOOOOOOOOOOOOOO. This ride has just become a family favorite. (you know what ride it reminds me of…..i am 60 years old!) But we understand and look forward to trying the new attraction. I LOVED the attraction especially after the balls were removed and you could focus on controlling the tire. This was a highlight of my days at DCA. But, I acknowledge many guests didn’t really understand how to control the tire. The new attractions sounds like it’s a lot of fun and surely will be appealing to kids of all ages. I’ve been there 10 times in the last year and never knew that ride even existed, i’ll need to try to ride it once before it leaves forever. Bummer; was hoping to catch it this year again. Glad our family got the chance to experience it in 2013. Surprised though that it’s getting a major overhaul after a short time. Did this attraction ultimately flop? Kind of excited to see something new there, but we loved these! It was so much better though when they had the beach balls too!!! I hope they are able to keep some of the decor inside though because it is awesome! See you soon Luigi, and we just might visit before you go. Sorry to see it go so soon, I loved the ride. A few times I even got to ride it alone where I could go flying back and forth without getting jammed up or hit by others. When the park would just open and everybody else was going to Radiator Springs Racer (since the single rider line for that doesn’t open until 5 or 10 minutes later) I would go here and be the only one out there and then they would allow me to stay on the ride a second time before I would leave. I have faith in Disney that the replacement will be just as cool to ride. I will miss this in the meantime. I always enjoyed Luigi’s Flying Tires. I know that for some people it was a frustrating experience, but I had gotten really good at moving around in my tire vehicle. When done, right, one could really move fast and it could be a very thrilling experience. For it to work, people really needed to follow the directions and just lean gently in the direction they wanted to go, and not lean too far, or else the vehicle would skid. I think it’s a shame that the ride did not work out, but I am looking forward to the new attraction, and I’m looking forward to hearing more about the new ride system. It was an ok ride/attraction. I loved the decor more than the ride itself. Look at the lines during offseason when at night the lows are 55-65 and have that air hit ya. Its cold as heck. Its nice in the summer when its 95 out. And also hoping like other commentors that we finally get a trackless ride. I like others was hoping that this wouldn’t happen, as I think it is a good ride. I was hoping for maybe changing the vehicles from all being white to some being green and some being red. I think it would be better to use the rest of the old Timon lot for a new attraction, perhaps a new cars themed dark ride instead of taking out an existing attraction. I’m definitely excited for this. I was at Cars Land on opening day and I’m glad I got to ride this attraction so early. I’m pumped for this change! I am interested to see what comes in its place, but I really like Luigi’s Flying Tires. I’m going to miss it when it’s gone. We rode this ride back in November 2012 and we thought it was really COOL! My husband didn’t think we would be able to “float” around because of his weight but actually we were moving more than many other people! I can at least say we rode it once and truly enjoyed it! Luigi’s Flying Tires is a very cute and fun ride but I gues that if we’re getting a ride with the trackless system used in Tokyo, Paris and Hong Kong, I’m not going to complain. Buon viaggio, Luigi! Looking forward to the new ride when you return. I love that they all have whitewall tires! But I trust something great will be coming in its place. Hopefully not just some extreme bumper car ride. Something really good. Fingers Crossed for the first “trackless” ride in the United States! While I’m sure the new attraction will be amazing too, I am a bit sorry to see this go. I am glad I got to ride it once while it was there. I guess the control difficulty was hard to overcome for many people? Sorry to see it pass into history like it’s (obviously much earlier) predecessor the Flying Saucers. hope it’s something similar to Radiator Springs Racers but for the younger kids. Dark ride maybe??? My son LOVES Cars and wanted to go on that ride so badly. He is 4 and special needs with sensory issues. He didn’t understand that it went fast, and insisted on going on it. Screamed and cried at the end during the race part. Was hard to get him on other rides the rest of the day. That was the only time he has been on it. I really liked Luigi’s flying tires. That was a lot of fun. Maybe they could bring them to Florida? I really wanted to love the Flying Tires — the idea was great, but it just didn’t live up to what I think we all hoped it would be. Very eager to see what the Imagineers will do here with the new ride system and vehicles … can’t wait to hear more details! Sounds Exciting! Looking forward to updates on DPB! Excited to see what’s next!